JERUSALEM – Israel Sci-Tech Schools, the largest independent network of science and technology educational institutions in Israel, will convene an international conference on Nov. 29 here that will focus on correcting global deficiencies in STEM (science, technology, engineering and mathematics) education. Nobel Laurate Prof. Dan Shechtman, of the Technion – Israel Institute of Technology, and venture capital leader Aaron Mankovski, managing general partner at Pitango and a graduate of Israel Sci-Tech Schools, are co-chairman of the conference. The confab will bring together international business, high tech and education leaders to address the need for STEM education to evolve from teaching the basics of mathematics and science, to now also include a greater focus on art, design and innovation. Participants will present the latest methodologies and breakthroughs necessary to prepare today’s elementary, secondary and junior college students for the ever evolving global workforce. The conference will address the growing mismatch between skills learned in the classroom and its application in the workforce. The disparity between the two is particularly large in Organization for Economic Co-operation and Development (OECD) countries such as Israel. 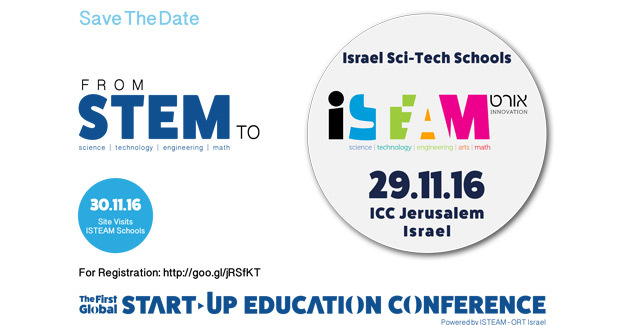 Participants in the conference will see technology projects developed by Israel Sci-Tech School students. In addition, much emphasis will be placed on the role of municipal officers in supporting meaningful education programs, and implementing cutting edge curriculums. Those interested in participating in the conference can get more information at http://goo.gl/jRSfKT.